CRIS distributes special radios and its 24/7 broadcasts of articles published in newspapers and magazines to individuals who are unable to read printed material due to vision loss or other disability. A suggested annual donation of $10 from each listener is recommended to help defray the radio station’s expenses. 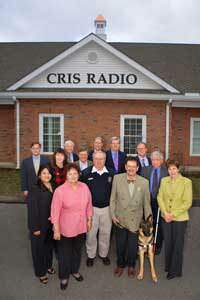 CRIS volunteers are a dedicated group, proud to deliver you the news you need. To receive a specially tuned CRIS radio or to access the CRIS Telephone Reader service, please print and return the completed the Application for Service to us. To listen online, click Listen Now on the top of the page.